Bikes, bikes and more bikes; and corn! The bikes began to pass us first thing this morning, one or two bikes for every two or three cars. By one o’clock the ratio had changed. By then we’d crossed the border into South Dakota. There were bikes on the road, bikes in the back of pickup trucks, bikes in trailers and bikes in toy haulers. There were girls, guys, one-up and two up, some pulling trailers, others packed with gear. There was even a “headless” rider! Or at least that’s what it looked like. When he passed us his gear was stacked so high behind him, that he couldn’t be seen, but a helmet attached to the side of the load created a strange illusion. There were bauld heads, scarved heads, hair flying, since riding without a helmet is legal in this state unless you are under eighteen. Often times, though, the women were wearing helmets as were some men. After we crossed into South Dakota, we stopped at the visitors centre and met up with many more bikers. We thought we were pulling a load until a huge motor home that must have been 42 feet long pulled into the parking lot. A lift on the back held a trike, and behind that was a twenty foot cargo trailer, presumably containing a few more bikes. Jim asked the fellow that was outside it if he found that the weight on the back made the front of the motor home lift. He was told, “It poses no problem. 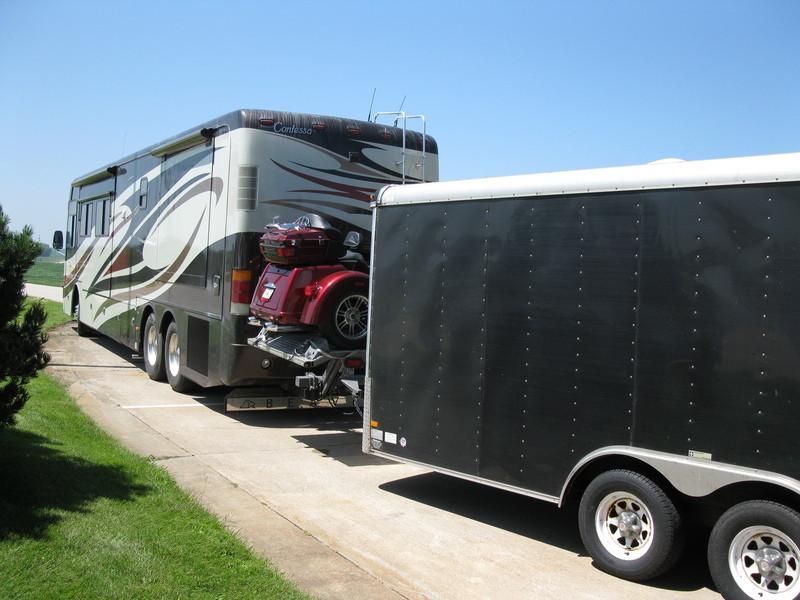 It’s much easier to pull with the motor home than with the hummer! At the visitor centre we picked up several brochures and when we said we were on our way to Sturgis, we were given a Rally Package. Inside was more literature about things to do and see in the area. Looking through them, stirred our excitement. We could spend a month here and never see all there is to see. As the day wore on, however, the cool temperatures of the morning turned hotter and more humid. We stopped more, as did many other bikers. The vehicle a/c wasn’t working. Our last stop was at Mitchell where we filled up with gas, bought a Dairy Queen treat and then visited the Corn Palace. The Corn Palace is an intriguing thing to see. The outside is adorned with pieces of art done entirely out of corn cobs of various colours, straw and other grains. Inside there are many more murals of the same medium. Amazing! And it was all free to see, even the parking. Purchases from the gift shop pay for the upkeep. When we left Mitchell it was already five o’clock and we’d still have a four and a half to five hour drive before we reached Sturgis. We decided we’d had enough for the day and looked for a campsite. 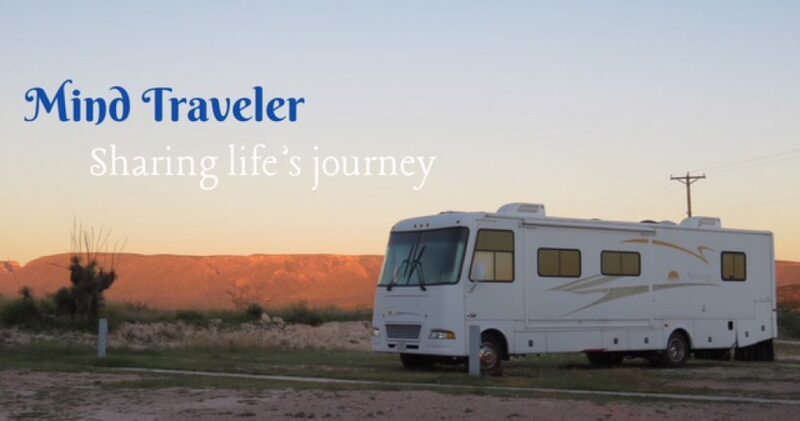 We found a quit RV park attached to a motel about thirty kilometres down the road. We plugged in, turned on the “house” a/c and barbecued outside under a tree. Sturgis can wait another day. 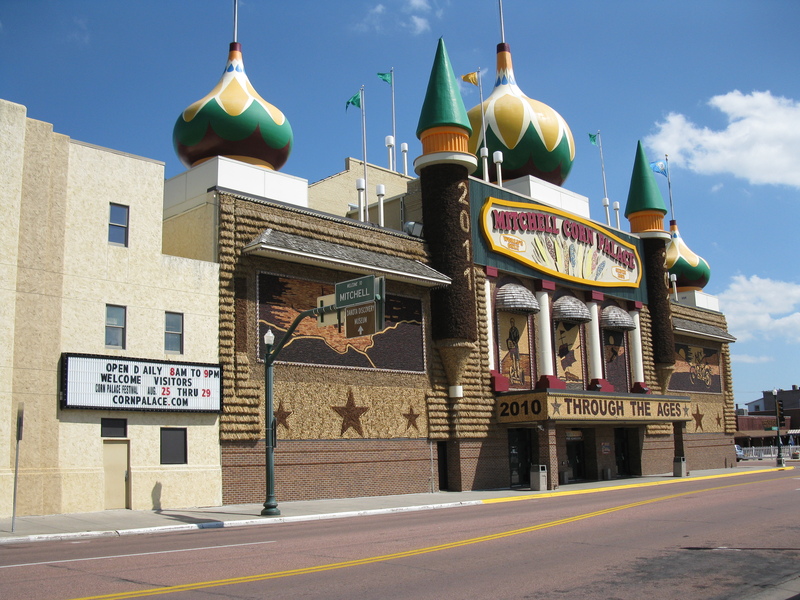 This entry was posted in Uncategorized and tagged bike rally, corn palace, RVing, Sturgis, travel. Bookmark the permalink. This is a neat account of the bikes, and the bikers. Do you find that the size is proportional –i.e. big guys riding big bikes? That’s what we noticed when we were on the road last year. There was quite a bike parade in Gatlinburg, TN. It’s fun to hear about some of the exchanges you’re having with other bikers. I’m glad you’re taking in some of the sites and describing them so well so we can join along.